We’d love your help. Let us know what’s wrong with this preview of Doctor Who by Jonathan Green. 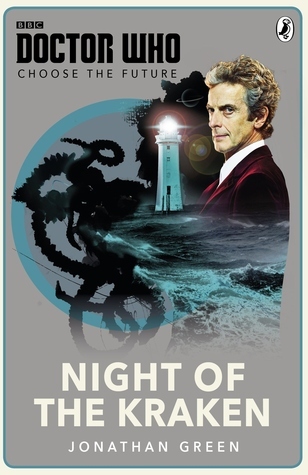 In this brand new adventure, Night of the Kraken, the Twelfth Doctor meets a roguish time-smuggler and faces a terrifying creature from the deep with a plan When one choice can lead to triumph or failure, life or death, glory or destruction . . . which will you choose? With Choose the Future, YOU decide how, when, where and with whom the Doctor will fight to save the world! A fun choose your own adventure style book featuring the 12th Doctor. It was pretty short and it felt like it could have done with a bit more content as the couple of read-throughs I did didn't take very long at all. Despite this I still enjoyed it and Jonathan Green managed to capture the spirit of the 12th Doctor very well. I'll probably return to this again to try out different paths through the story. Classico libro gioco, crei l'avventura in base alle risposte proposte per ogni azione. Il dodicesimo Dottore, alieni, villaggi abbandonati, fari misteriosi... veloce, semplice, un classico prodotto per ragazzi. You know why I bought this? It's a choose your own adventure. I had been possibly 25 years since I've read a CYOA book, and this was every bit as fun as I remember them to be. The story was quite juvenile, but I wasn't expecting any great, literary novel to happen. It was fun, enjoyable, and a quick read, also good to read out loud to friends while you drink a coffee or three. Like Doctor Who? Pick this one up! A nice little book to enjoy over and over: it is a gamebook, in which you can decide what the Doctor does at the end of each chapter. You do not read it from start to finish, but you follow the story, and I love those! I really recommend it. I don't know how one marks a book like this finished, but I have done many of the story possibilities and would like to put it down. It's a wild ride and it's fun to see 12 written canonically instead of, well, not. I loved it and I hope there are more. Great! Got the less than stellar ending - time to reread! I'm not entirely sure how one marks a book like this finished, and I'm fairly certain I haven't managed to explore all the possible story threads, but frankly, the book smells so bad that I can't seem to spend more than 8-10 minutes at a time with it before feeling like throwing up (yeah, I know, I'm supposed to love "the feel and smell of real books" but the combination of paper and ink is awful in this one, sorry). So I'll probably be dipping in and out whenever I feel like it, but for the time I'm not entirely sure how one marks a book like this finished, and I'm fairly certain I haven't managed to explore all the possible story threads, but frankly, the book smells so bad that I can't seem to spend more than 8-10 minutes at a time with it before feeling like throwing up (yeah, I know, I'm supposed to love "the feel and smell of real books" but the combination of paper and ink is awful in this one, sorry). So I'll probably be dipping in and out whenever I feel like it, but for the time being, I'm marking it finished since I've read at least a fair amount of the possibilities. I didn't grow up with books of the "choose your own adventure" kind so maybe that's the problem, and obviously I'm not the target audience anyway, but whatever the reason, I'm not really getting on with the format. Maybe if the bits were longer? As it is, it seems I've spent twice as much time flipping the pages and trying to locate the next bit than I have reading, and this means a very disjointed reading experience. Other than that - does it feel like all I'm doing is complaining? because it feels like that to me, oops - I actually enjoyed the story bits (that I could locate and tease out and make sense of) well enough. There's one with the Terileptils that was okay. And some possibilities involving Bess the barmaid that were promising. Ultimately, I do think I'm just, well, not really the right audience for this. I'd much prefer a book of straightforward short stories - or barring that, a book with much longer sections between making one choice or another. But since it seems we're not getting any actual novels, or anything beyond comics featuring the Twelfth Doctor at all this year (other than the Christmas special on TV), this new line will have to do, I suppose. A chopped up, disjointed, ultimately quite unsatisfying Twelve is still better than no Twelve at all, after all. Jonathan Green, “Night of the Kraken: Doctor Who – Choose the Future” (London: London, 2016). A fun interactive way of reading about a classic character. “With a grinding wheeze the TARDIS materialises and comes to a juddering halt. “'Zombies and mysterious strangers with the wrong weaponry for this century aren Jonathan Green, “Night of the Kraken: Doctor Who – Choose the Future” (​​London: London, 2016). Note: In our first reading we came to Entry 133 which included information that we hadn't encountered before so it made no sense. This must be a mistake. “'What does it do?' Asks Ravenwood. When one choice can lead to triumph or failure, life or death, glory or destruction . . . which will you choose? With "Choose the Future," YOU decide how, when, where and with whom the Doctor will fight to save the world. In this brand new adventure, "Night of the Kraken," the Twelfth Doctor meets a roguish time-smuggler and faces a terrifying creature from the deep with a plan to destroy the Earth. The fate of the Doctor and the universe he protects are in your hands. Se nota que no sería jamás el Doctor, porque todas las elecciones que tomo acaban con la historia yendo fatal así que... bueno. Es mi primera experiencia en este tipo de historias en las que eliges tú y la verdad es que me lo he pasado bastante bien. La historia es sencillita, nada del otro mundo, tampoco, y las opciones aunque limitadas están bien hiladas y aunque un poco cortas, te llevan más o menos hacia el target en el que está enfocado el libro, que supongo que será un target un tanto más joven que el resto de libros. More fun than it is good, because of the "Choose the Future" format. Still manages to be a recognizable Doctor Who story, though, with all that this entails. Brilliantly well put together, I thought, but I found that I am perhaps too old to be flipping pages back and forth this much. I got three distinct tales out of this before I had a section overlap, so definitely worth the money and Fall Break reading time. Jonathan Green is a writer of speculative fiction, with more than seventy books to his name. Well known for his contributions to the Fighting Fantasy range of adventure gamebooks, he has also written fiction for such diverse properties as Doctor Who, Star Wars: The Clone Wars, Warhammer, Warhammer 40,000, Sonic the Hedgehog, Teenage Mutant Ninja Turtles, Moshi Monsters, LEGO, Judge Dredd and Robin Jonathan Green is a writer of speculative fiction, with more than seventy books to his name. Well known for his contributions to the Fighting Fantasy range of adventure gamebooks, he has also written fiction for such diverse properties as Doctor Who, Star Wars: The Clone Wars, Warhammer, Warhammer 40,000, Sonic the Hedgehog, Teenage Mutant Ninja Turtles, Moshi Monsters, LEGO, Judge Dredd and Robin of Sherwood. He is the creator of the Pax Britannia series for Abaddon Books and has written eight novels, and numerous short stories, set within this steampunk universe, featuring the debonair dandy adventurer Ulysses Quicksilver. He is also the author of an increasing number of non-fiction titles, including the award-winning YOU ARE THE HERO – A History of Fighting Fantasy Gamebooks.